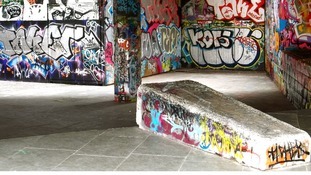 The undercroft claims to be the oldest surviving skateboarding spot in the world. Photo: . The Southbank is the centre of London's skateboarding scene - and claims to be the oldest surviving skateboarding spot in the world. The Southbank wants to change this famous 60s façade to a modern floating glass front and move the skateboarders to a new spot 100 yards away. Building them brand new facilities - surely a sweet offer? The skaters say not. London's mayor has now thrown his weight behind this campaign sending the Southbank Centre's plans into a spin. we are surpirsed by the mayor's unexpected statement. We look forward to hearing how he intends to fill the financial gap that now stands between us and our ability to provide free art and culture to millions of Londoners. The Southbank centre wants to build shops here but Lambeth council has yet to decide on the planning application. London's skaters are hoping the plan is rejected and the whole thing grinds to a halt.